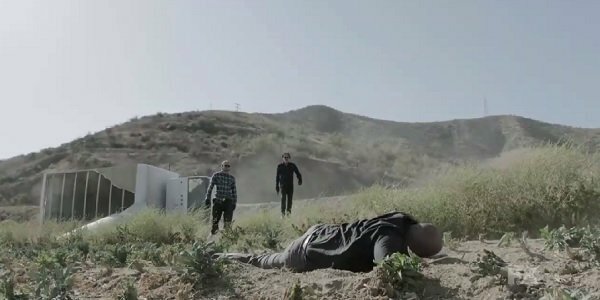 I’m in need of a few more adrenal glands to regulate the massive amount of adrenaline flowing through my body, as provoked by our first real look at Season 7 of Sons of Anarchy. After weeks of short teasers proving Jax’s worth as a Grim Reaper, FX dropped a minute-long dive into the dark rabbit hole that is SAMCRO’s future, and it’s got all the angst, fear and gunplay expected of a Sons of Anarchy trailer. But nobody from the laundry list of guest stars shows up, making me wonder if I just dreamed that Marilyn Manson and Malcolm-Jamal Warner are in this. If you’ll remember, Season 6 ended with a carving fork being driven into the back of Tara’s head, and Gemma was the one forcing it in there. Sheriff Roosevelt showed up just after, but Juice put him down before anything official could be done about the murder. Jax then arrived home, completely stunned and heartbroken, having believed his life had finally risen above the mess that it’d been since this series began. Season 7, the final ride for Sons of Anarchy, takes place soon after those events, with Jax serving time in Stockton, where he meets Manson’s white supremacist and presumably sets some kind of a plan in action. SAMCRO will probably have some problems with Marcus Alvarez and his Mayan crew, given the way they murdered August Brown’s One-Niner underlings. But that doesn’t mean the whites and blacks can’t have some scuffles of their own. The trailer, courtesy of IMDb, is largely an introduction into Jax's homicidal brand of vengeance. He's out to take down whoever he thinks is responsible for killing Tara, since he clearly doesn't believe it's Gemma. She's interested in keeping that heinous crime a secret, saying that the best thing for everyone is to keep the truth hidden. The clock is ticking for Juice as well, and one has to wonder if he'll perhaps take the blame for Tara's death in his final minutes as a last testament to his respect for Gemma. Or maybe he'll give it all up to save his own skin. That last one sounds more appropriate.Bodies are dropping, regardless of who ends up being proven guilty. And who's this guy? He doesn't look like he's going to be breathing much longer. The trailer fails to properly introduce us to this mysterious baby that Wendy is holding. Am I just forgetting someone who was pregnant, or is this a teaser of hideous things to come in the future? For Season 7, Sons of Anarchy is also welcoming Annabeth Gish as Charming's new sheriff, Courtney Love as a preschool teacher, and Lea Michele as a truck stop waitress. O, the fun we'll have! Tune into FX on Tuesday, September 9 for the 90-minute season premiere.